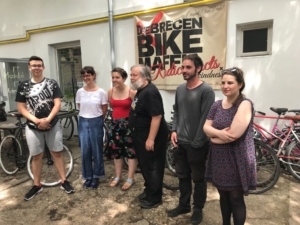 Following our informal meeting with several key members of the Dignified Living Working Group in Budapest last Thursday, on Friday we got to know more about them and their key issues. This coalition of activists with experience of poverty (organizations and individuals) that share a common mission to achieve a dignified life for all people in Hungary, through grass-root organization and campaigns. It proved an inspirational day, showing how adversity can drive creativity. A real symbol of hope and positive organization, against incredible odds! In the morning we met with Dora Papp, from AHang (The Voice). This is the first Hungarian on-line campaigning platform, recently launched in March. They coordinate on-line mobilisation, eg petitions or mass email campaigns etc, for a large number of community-based actions, as the first step to coordinated activism. People in Hungary are very burnt out by traditional campaigning. The restrictive laws on civil society have stifled effective organization, particularly in rural areas. The access to traditional media is also blocked because of government control. This platform aims to build a continuous activist pool, connected through on-line activity. Some of these campaigns have included: getting out the vote during the elections, campaigns on raising family allowances, improving affordable public transport or housing, or increasing carers allowances for families with children with disabilities. What do they have in common? All the actions are initiated by grass-root movements. They share a commitment to common goals and are focused on concrete actions which can mobilize and unite the maximum number of people. The issue of the fight for an adequate income/income support for all groups, is a clear priority. A strong common strand is the fight for political rights, seen as a pre-requisite to being able to achieve more social rights and to reduce poverty. In the last elections, there was significant evidence that most political parties tried to buy votes, offering 10-20 Euros to people living in poverty, including Roma, in return for their vote. “Everyone is afraid”, they said. Often these fears are channelled against migrants and exacerbated by fears of repercussions as “everybody knows their business”. The government seems all powerful and all seeing. People in poverty feel that even their meagre allowances are under threat, if they don’t toe the line. The ‘get out the vote campaign’, focussed on raising awareness about people’s right to vote encouraging them to make their own choices and to fight political intimidation, together. Worryingly, the EU itself is seen in Hungary as a threat. The current government organized a successful campaign using billboards and a small booklet highlighting ‘negative EU actions’ including the EU’s supposed role in enforcing migration as well as austerity on Hungarian people. The opposition struggled to find positive evidence to challenge this narrative. Already the network has registered 30.000 people involved in on-line campaigns, 2 million views for key videos shown on you-tube – all building to create an activist base of over 5.000 people. This is then targeted on concrete physical actions. During a campaign on housing, 30.000 e-mails were sent targeting the local authority which had evicted 6 families. The local authority was forced to meet with the campaign. Can they help to achieve stronger welfare states? Many people are suspicious of the welfare state, seeing it as working in the interests of the rich. The awareness is building that the old social protection system gave them better health, pensions, income support, but it’s getting worse. Regressive taxation is seen as a key part of the problem. Taxes are high ie 50-60% but flat ie everybody pays the same regardless of their income level. The very high VAT rate at 27%, also hits the poor hardest as they spend a higher % of their income on basic services. Public services are still seen as quite good, but increasingly out of reach of the poor, particularly those on a minimum wage of 300 euros. It’s even worse for those on a piecemeal minimum income of less than 100 Euros. The main challenge is to find a way to reach people through the barrage of misinformation and fear. This platform offers a way to “keep hope burning of a better future”. 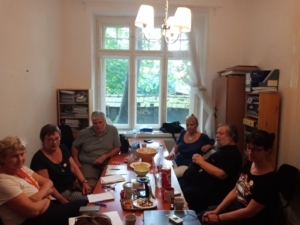 After lunch with the Hungarian EMIN network, we returned to meet key individual member organizations of the Dignified Living Working Group: the Hungarian Unconditional Basic Income group and the Step by Step Association both led by women activists with experience of poverty. Both organizations successfully organized major campaigns, including through on-line tools and social media and mutually support each other through the Dignified Living Working Group. The Step by Step Association was presented by their President, Annette. She herself has a son with severe disabilities. They have carried out a highly successful campaign over several years for an increased allowance for carers of children with disabilities. 45.000 families are affected, struggling to live on minimal allowances of 60 Euros a month. Their yearly campaigns are highly visual and communication-focussed attracting the attention of media and the general public, within and outside Hungary. For example, in 2014, they worked together with the Responsible Budget Institute which calculated how much it would cost to provide equivalent care in an institution, then argued that parents should receive at least the same: 250 Euros! As a result they won a 5% increase. In 2015, they focused on presenting cross-border comparisons eg showing that Romania has significantly higher levels, and ‘caring’ for children with disabilities counts as employment status. Each year, they build momentum and increased support, but always rooted in a physical group of parents, mainly mothers of children with disabilities, supported by the wider network. The Basic Income campaign, presented by Gyorgy their President, achieved 14,500 signatures in the European Citizen’s Initiative campaign, when there was a ceiling of 16.000. This led to a significant increase in awareness about unconditional basic income, putting it high on the national agenda, including of some political parties. For the Hungarian Network, basic income and minimum income are not seen as conflictive campaigns but two sides of the same coin, offering slightly different routes to the same goal: to abolish poverty and ensure a life in dignity. “We have very limited resources as NGOs, and face enormous challenges to achieving a more dignified life for most people in the current context. Without each other we can’t hope to achieve anything”. A shining example of solidarity in action! Thank you EMIN and EAPN Hungary!